Though Apple announced the iPhone 5 this morning to much fanfare, Phil Schiller defended the new smartphone against some criticism amid the media blitzkrieg. Apple's senior vice president of worldwide marketing explained in an interview with AllThingsD why some expected technologies such as Near Field Communication (NFC) and wireless charging didn't make it in the final product. Both technologies have many examples in the current market, and have been on the wishlist of Apple fans for quite some time. NFC has seen its way onto many phones like the Google Nexus S and can be used to pay for groceries or share data in person. Schiller said that Apple's program, Passbook, is a capable analog to NFC in the wireless commerce market. However, Passbook is mainly used to store loyalty cards, gift cards and can be used instead of boarding passes and football tickets. Schiller said he has his doubts about NFC, and wonders if it's the solution to any of today's problems. Passbook, he said, fulfills most of customers' current needs, saying it works without any existing merchant payment system. Technophiles were also hoping the iPhone 5 would include some sort of wireless charging system like the Nokia Lumia 920, but Schiller dashed those hopes as well. Schiller pointed out that wireless charging stations still need to be plugged into a wall and that the USB cord is still widely used and can be plugged into wall outlets with the packaged adapter, into computers or even on airplanes. He said it just not worth it to add another component. "Having to create another device you have to plug into the wall is actually, for most situations, more complicated," Schiller said. 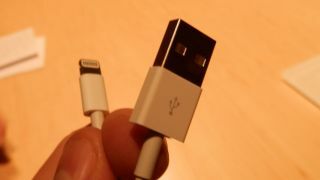 Apple also took a little flak for changing the iPhone and iPod's docking jack, to the smaller "Lightning" connector. The previous design was introduced in 2003, and an entire side industry uses the port to connect the phone to almost anything. Schiller said the company had been waiting to pull the trigger on the new cord for a while, but now they couldn't make the mobile devices any smaller or thinner with the old cord. But Apple doesn't change their connectors willy-nilly. "This is the new connector for many years to come," he said. So it looks like we won't be seeing native wireless charging for a while now, and Apple is content to dip its toe in the pool of wireless commerce. For now, they're just two more items to ask Santa for when iPhone 6 speculation begins.